Part of me still holds movies with Feminist movies originally written by men with suspicion. Not to say that men can’t write great Feminist movies, because they absolutely can. Anyone can write a movie that corresponds with Feminist values. But it’s always weird to me whenever a story portrays every character of a certain gender as universally evil and everyone from another gender as universally good. If they’re not universally good, then they’re at least much more nuanced and more interesting. It’s even more disarming when you discover that the author shares the gender that they paint as universally evil. It throws you off a bit. That being said, Dolores Claiborne is an amazing story. It’s incredibly written, and I’m glad to see a crime story told in a slow, deliberate manner. But it’s such a weird thing to see certain characters written by Stephen King portrayed so deeply and well and others so painfully superficial. It’s very weird, an I don’t know who to blame for it. But we have these amazing female characters because of it, so I guess I can’t complain too much. We’ll just have to do better next time. The gist: Dolores has killed someone. Again. Well, not really. She’s just accused of killing someone again. The first time, it was her drunk husband who she alleges beat her regularly. 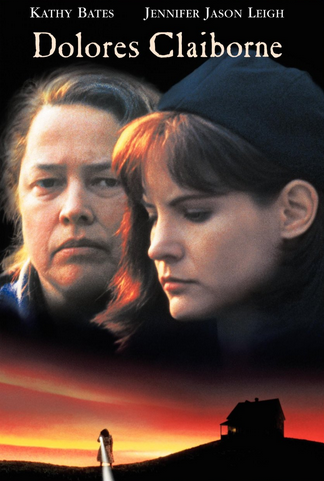 But now, Dolores Claiborne (played wonderfully by Kathy Bates, except for her horrid accent) is accused of killing her elderly employer, for whom she worked under for thirty years. Dolores’s hard-nosed daughter Selena has come as a legal support, even though Dolores refuses to get a lawyer in her own defense. Why should she? Everyone’s so convinced that she did it already. It’s not like she can fight what everyone thinks of her… it sure didn’t work with Selena. What I “learned”: Is it really too much to ask for every character in a crime movie to have some complexity? Especially if it’s a slow and complex crime story that takes place in a small town? I don’t mean to rephrase all of what I wrote above, but the vast difference in depth between the male and female characters in this movie is staggering. Dolores and Selena are beautifully written characters, and put characters like the detective and Selena’s father to shame. This isn’t to say that every villain has to be complicated in motive. But it’s such a shame to watch the movie treat its characters so unevenly. More love for everyone, please! See this movie if you like: Dysfunctional family movies that don’t hesitate to be awful. There’s abuse in this movie, sexual and physical. It’s not glamorized at all. It’s friggin’ terrible. There were seriously scenes where I had to look away. But this is refreshing. Finally, a portrayal of abuse as something that potentially ruins a person’s life. Avoid this movie if: Terrible/inaccurate accents grate on your nerves. Seriously, these are the worst I’ve ever heard in my life.